Stunning Maxi dress that will become your favorite piece during pregnancy, while breastfeeding and well beyond. Flattering asymmetrical hemline accentuates the legs while Empire V neckline accentuates the bustline. Double layer bodice allows for easy and discreet nursing. Contrast fabric gives the look of a wrap dress but is actually sewn closed so no accidental exposure. 95 Promodal / 5 % Lycra Machine wash cold on gentle. Tumble dry low. 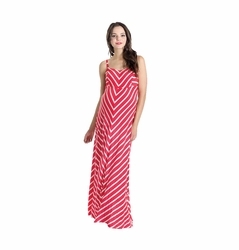 Ripe Maternity's maxi dress features a braided neckline and rope belt. Side slits show off your legs and also make it easy to move in. You'll love this dress during and after pregnancy. Updated chevron print on a diagonal.